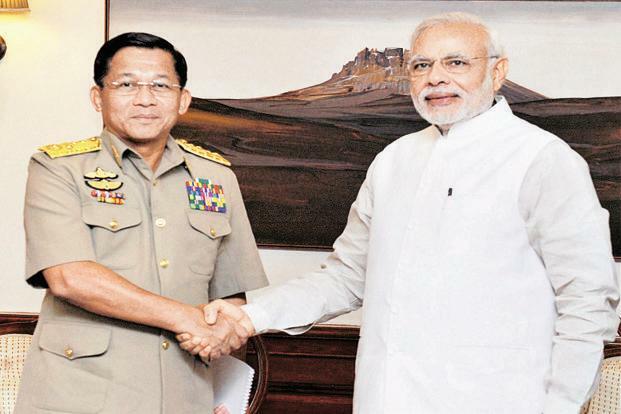 Myanmar’s senior general U Min Aung Hlaing with Prime Minister Narendra Modi on Wednesday. New Delhi: India and Myanmar pledged to deepen their bilateral security cooperation, with senior leaders of both governments expressing their resolve during talks in New Delhi, a statement by the stated on Wednesday. Senior general U Min Aung Hlaing, commander-in-chief of Myanmar Defence Services, who is on a visit to India, called on India’s three service chiefs as well as Prime Minister Narendra Modi in New Delhi. The visit by the senior general of Myanmar follows a raid by the Indian Army last month to hunt down separatist militants, days after 18 soldiers were killed in an ambush in the Chandel district of Manipur. Myanmar authorities had later stated that the Indian troops had not crossed into the country’s territory. “Senior general U Min Aung Hlaing expressed his commitment to deepen defence and security engagement with India, including in the maritime security domain,” a statement from the prime minister’s office said after the meeting. India’s north-east is home to dozens of insurgent groups, fighting for autonomy or secession. The Indian Army has been deployed in the region that borders Myanmar, Bangladesh and Bhutan, for decades. Indian officials say militant groups have set up base in Myanmar and Bhutan, using them as launch pads for attacks against India. Throughout the 1980s and early 1990s, India backed Myanmar’s pro-democracy icon Aung San Suu Kyi. But it changed tack after realizing that the insurgent groups operating in the north-east have established bases in Myanmar. India then actively engaged the then junta-run government, investing in infrastructure projects, exploring oil and gas blocks, and offering credit. Ties were sustained after Myanmar slowly transitioned into a democracy with the first election in two decades being held in 2010. “Senior general U Min Aung Hlaing appreciated India’s role as a reliable development partner for Myanmar. He said that Myanmar considers its relationship with India very important, not only as a neighbour, but also as a country with longstanding historical and cultural ties, shared interests and strong people-to-people ties with Myanmar,” the statement said. “He added that Myanmar will remain an important platform in support of India’s Act East Policy,” the statement said, referring to India’s efforts to forge closer links with South-East Asia. On his part, Modi underlined “India’s commitment to strengthen the bilateral relationship with Myanmar in all areas, including defence and security” besides support Myanmar in its endeavour for national development, the statement said. The prime minister said India regarded Myanmar as “India’s gateway to Asean (Association of Southeast Asian Nations) and urged for greater connectivity between the two countries and beyond, the statement said. With Myanmar due to go in for general elections in November, Modi said he respected “the desire of the people of Myanmar for a transition to a stable multi-party democracy, and conveyed his best wishes for the upcoming elections in Myanmar to be peaceful, free and fair”.